but of balance, order, rhythm, and harmony. My design wall reminds me of the ocean waves on the sand – it fills and then empties. Towards the end of this week, a rather chaotic wall was beginning to reflect closure on some projects and beginnings on others – a good place to be in, a nice rhythm. A good deal of this week was devoted to completing my daughter’s baby quilt. 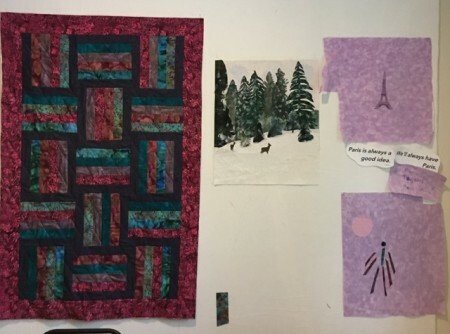 The photo below shows a quilted but not yet bound version. I am happy to report that said quilt is now bound and awaiting use. My dyeing class continued and I opted for a measured approach to week two. We were supposed to try some deep water bucket dyeing versus the low water immersion technique of the week before. As I studied the material, I realized that the likelihood of my using the deep water technique was minimal and that the dilutive approach to dyeing was not as straight forward in measuring as the additive approach. Since my objective in the class was to understand the dyeing process better and become comfortable with some ‘simple’ processes for dyeing small amounts of cloth, I opted to focus my actual dyeing on continuing with the additive process. I added three additional colors to my experimentation this week. While all these decisions meant less actual time dyeing, I felt like I was immersing myself in the area that would really benefit me in the long run and allow me to think it through more fully while I had the benefit of an excellent instructor. While the baby quilt definitely absorbed the most time this past week, my winter scene also moved forward. 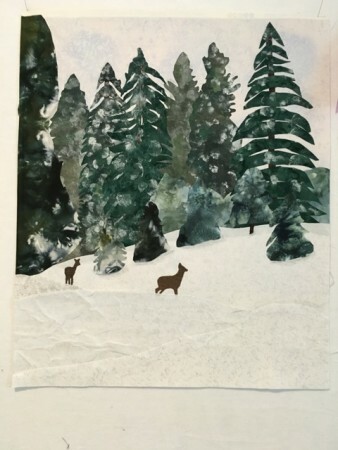 I added the snow to the trees and completed fusing the lower portion of the piece. 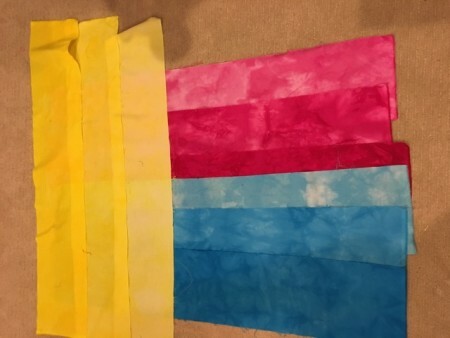 The photo below shows the work ready for quilting. 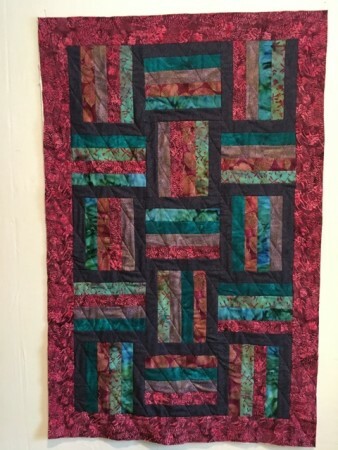 I intend to trim both sides for a more rectangular finish but felt that was best done after quilting. My goal for next week is to actually complete the quilting! My hand stitching continued, primarily in the evenings and I ordered a book of transfer letters that I hope will move me forward with my Eiffel piece. With luck, I will report more on those next week. For now, I will link to Off the Wall Friday and wish everyone fun in their own ventures. I particularly like the development of your winter scene. This is the type of work that I like to do, interpret a photo into cloth. Wonderful to see the projects! I agree, the winter scene is moving along beautifully from my vantage point!